In 2004, architect Casey O'Callahan remodeled the 6,582-yard layout with player consultant, LPGA legend Amy Alcott, who has helped make the South an area women's favorite from the 4,878-yard forward tees. This scenic course is home to four ponds and 850 palm trees. Also, 500 Washingtonia Filifera, a cherished tree of the Agua Caliente Native American tribe, are abundant throughout the course. Golfers will particularly enjoy the South's five par 5's to take on during the round. Once considered a hidden gem off the beaten path to Coachella Valley visitors, today, Indian Canyons can be found right in the heart of all the action in Palm Springs. 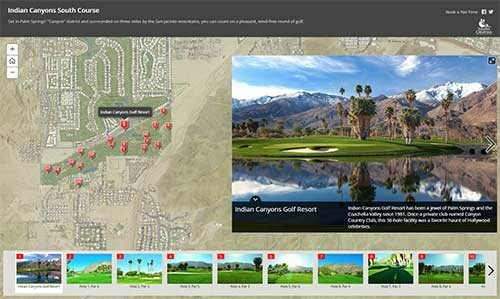 Indian Canyons is 20 minutes from Palm Springs International Airport and only 10 minutes south from downtown Palm Springs.Following a round at either course, golfers can enjoy dinner and drinks in the South clubhouse while enjoying panoramic views of the surrounding San Jacinto mountains.